The majority of professional and individual traders use somekind of trading software on which to base their strategies. Withover 100,000 users, the most popular trading software today isTradeStation, published by TradeStation Technologies. 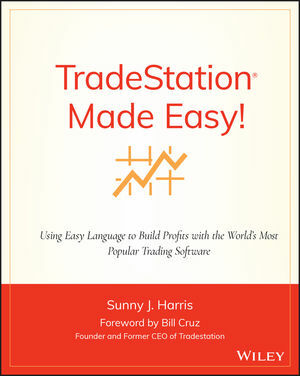 While thissoftware is favored by many, TradeStation's computer language canbe confusing, especially for the novice. TradeStation Made Easy! is the first and only book to explainexactly how to use the unique computer language behind thisbestselling software program. It is not meant as a replacement forthe TradeStation manuals, instead it will cover the essence ofprogramming in EasyLanguage and focus on a consistent set of dataand an elementary system throughout. TradeStation Made Easy! fills a much-needed gap in thisarea and puts the basics of EasyLanguage in perspective. With it,you'll be able to write simple and intermediate programs that willaccurately express your theories and ideas about whatever marketinterests you. Sunny J. Harris is a professional trader and President of Sunny Harris Enterprises, Inc. A former member of the Market Technicians Association, she is also publisher of the popular Trader's Catalog and Resource Guide (TC&RG). Ms. Harris was the number one trader two years in a row in the under-$10 million category rated by Stark Research, achieving a 365% profit in 1993 and 178% in 1994. She is the author of four other books: Trading 101, Trading 102, Electronic Day Trading 101, and Getting Started in Trading. Chapter 1 Introduction To Easylanguage. Chapter 3 Understanding The Process. Chapter 4 Basic Use Of TradeStation. Chapter 9 Ifs, Ands, And Buts. Chapter 10 Begin And End (Block Statements). Chapter 13 Buying And Selling. Appendix D Full Code For The System And Studies In ThisBook. Appendix F Where's The Command? Appendix G.1 Built-In Functions And Indicators (AlphabeticalListing). Appendix G.2 Built-In Functions And Indicators (FunctionalListing). Appendix H Tradestation Add-On Products And Services. Appendix I Tradestation User Groups. Appendix K What's Wrong With This Code?